Across the United States, habitual offenders plague the country’s courts, prisons and community-supervision programs. With high rates of recidivism, the broken system wastes taxpayer dollars, threatens the safety of our communities and demoralizes victims by leaving many offenders unaccountable, according to the American Legislative Exchange Council (ALEC). In response to record-level violent crime rates in the late 1980s and early 1990s, policymakers at all levels of government got “tough on crime” by passing legislation calling for broad mandatory minimum sentences, such as “three strikes” laws and adopting strategies that called for the arrest and prosecution of all crimes large and small. These policies of mass incarceration came at a high cost; taxpayers now spend $80 billion per year on the criminal justice system. In addition to the economic costs of high incarceration rates, the societal costs such as broken families, interrupted lives and permanent criminal records, are many. Unfortunately, this enormous investment has failed to deliver proportionate public safety returns. Forty percent of offenders released from prison wind up back behind bars for violating the terms of their supervision or committing a new offense. – The Recidivism Reduction Act requires a certain percentage of offenders be supervised in accordance with evidence-based practices. Examples include risk and needs assessment, individualized case plans and graduated sanctions. – Within four years, a certain percentage of state funds for offender programming should be spent on programs that are evidence-based. 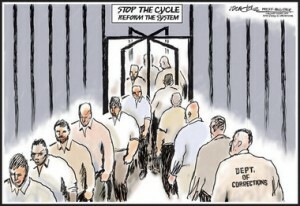 – Community corrections agencies must improve policies and practices for crime victims. – Agencies are required to provide employee training on evidence-based practices. The Recidivism Reduction Act and similar reforms implement evidence-based programs such as graduated sanctions and personalized case programs informed by an offender’s risk and needs assessment. These reforms measure outcomes to ensure policies are working as intended to reduce recidivism and protect public safety.